Have you ever thought that prosperity and adversity are direct opposites? Generally, when you think of the opposite of prosperity you think of poverty. And, when you consider the opposite of adversity you might think comfort or success. In the Bible we will see that, as odd as it may seem, prosperity and adversity directly contradict each other. 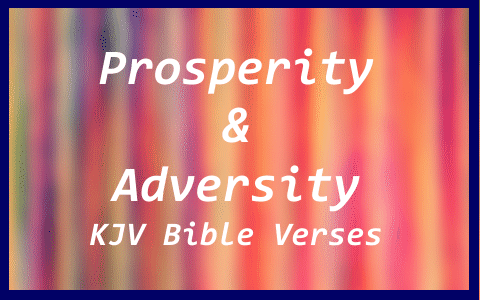 Here are some KJV Bible verses about prosperity and adversity for you to consider. Psalm 73:3 For I was envious at the foolish, When I saw the prosperity of the wicked. Luke 12:16–19 And he spake a parable unto them, saying, The ground of a certain rich man brought forth plentifully: And he thought within himself, saying, What shall I do, because I have no room where to bestow my fruits? And he said, This will I do: I will pull down my barns, and build greater; and there will I bestow all my fruits and my goods. And I will say to my soul, Soul, thou hast much goods laid up for many years; take thine ease, eat, drink, and be merry. Genesis 39:2–3 And the LORD was with Joseph, and he was a prosperous man; and he was in the house of his master the Egyptian. And his master saw that the LORD was with him, and that the LORD made all that he did to prosper in his hand. 2 Chronicles 26:4–5 And he did that which was right in the sight of the LORD, according to all that his father Amaziah did. And he sought God in the days of Zechariah, who had understanding in the visions of God: and as long as he sought the LORD, God made him to prosper. Psalm 1:1–3 Blessed is the man That walketh not in the counsel of the ungodly, Nor standeth in the way of sinners, Nor sitteth in the seat of the scornful. But his delight is in the law of the LORD; And in his law doth he meditate day and night. And he shall be like a tree planted by the rivers of water, That bringeth forth his fruit in his season; His leaf also shall not wither; And whatsoever he doeth shall prosper. Leviticus 26:15–16 And if ye shall despise my statutes, or if your soul abhor my judgments, so that ye will not do all my commandments, but that ye break my covenant: I also will do this unto you; I will even appoint over you terror, consumption, and the burning ague, that shall consume the eyes, and cause sorrow of heart: and ye shall sow your seed in vain, for your enemies shall eat it. Deuteronomy 28:47–48 Because thou servedst not the LORD thy God with joyfulness, and with gladness of heart, for the abundance of all things; Therefore shalt thou serve thine enemies which the LORD shall send against thee, in hunger, and in thirst, and in nakedness, and in want of all things: and he shall put a yoke of iron upon thy neck, until he have destroyed thee. Psalm 16:3–4 But to the saints that are in the earth, And to the excellent, in whom is all my delight. Their sorrows shall be multiplied that hasten after another god: Their drink offerings of blood will I not offer, Nor take up their names into my lips. Isaiah 8:20–22 To the law and to the testimony: If they speak not according to this word, It is because there is no light in them. And they shall pass through it, hardly bestead and hungry: And it shall come to pass, that when they shall be hungry, they shall fret themselves, And curse their king and their God, and look upward. And they shall look unto the earth; And behold trouble and darkness, dimness of anguish; And they shall be driven to darkness. James 5:1–2 Go to now, ye rich men, weep and howl for your miseries that shall come upon you. Your riches are corrupted, and your garments are motheaten. Psalm 37:19 They shall not be ashamed in the evil time: And in the days of famine they shall be satisfied. Proverbs 3:4–6 So shalt thou find favour and good understanding In the sight of God and man. Trust in the LORD with all thine heart; And lean not unto thine own understanding. In all thy ways acknowledge him, And he shall direct thy paths. Isaiah 26:3–5 Thou wilt keep him in perfect peace, Whose mind is stayed on thee: Because he trusteth in thee. Trust ye in the LORD for ever: For in the LORD JEHOVAH is everlasting strength: For he bringeth down them that dwell on high; The lofty city, he layeth it low; He layeth it low, even to the ground; He bringeth it even to the dust. John 14:27–28 Peace I leave with you, my peace I give unto you: not as the world giveth, give I unto you. Let not your heart be troubled, neither let it be afraid. Ye have heard how I said unto you, I go away, and come again unto you. If ye loved me, ye would rejoice, because I said, I go unto the Father: for my Father is greater than I. 2 Corinthians 4:8–10 We are troubled on every side, yet not distressed; we are perplexed, but not in despair; Persecuted, but not forsaken; cast down, but not destroyed; Always bearing about in the body the dying of the Lord Jesus, that the life also of Jesus might be made manifest in our body. Philippians 4:12–13 I know both how to be abased, and I know how to abound: every where and in all things I am instructed both to be full and to be hungry, both to abound and to suffer need. I can do all things through Christ which strengtheneth me. Previous post: What Is Christian Mysticism? Next post: What Is Missiology?